The Trumpeter Swan Society (TTSS) is a non-profit organization dedicated to assuring the vitality and welfare of wild Trumpeter Swan populations. I am highlighting the society’s efforts in this month’s Notes on Conservation blog post. 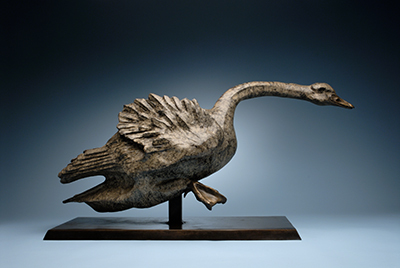 I will donate a portion of the sales my or any of my other sculptures to The Trumpeter Swan Society or a charity of your choice. “Early settlers nearly destroyed this magnificent species, but many people have worked hard to save the last remnants and start them on the path to recovery. It is now up to us all to help nurture that recovery and help ensure that Trumpeter Swans will be secure in our modern world. TTSS is a means for those who cherish these swans to work together and support their continued restoration. Since our founding in 1968, TTSS has provided the vision, knowledge, and advocacy to move restoration efforts forward and improve management of Trumpeter Swans across North America. Our 500+ members in the U.S. and Canada include interested private citizens, waterfowl propagators, businesses, and many of the professional waterfowl biologists and managers who have guided Trumpeter Swan management in recent decades. Our annual programs are developed from our 2010-14 Strategic Plan, which lays out our Mission, Values, 5-Year Operating Goals, and Objectives. Most of our accomplishments result from the work of our members and Board of Directors in their professional roles and through their countless hours of volunteer effort. The Society is run by our Board of Directors, part-time Executive Director and part-time Outreach Coordinator, who work from their homes, and a part-time Administrative Assistant located at our administrative office at Three Rivers Park District, Plymouth, Minnesota, where TTSS began. For more information on The Trumpeter Swan Society, click here. I will donate a portion of the sales of this or any of my other sculptures to The Owl Foundation or a charity of your choice. 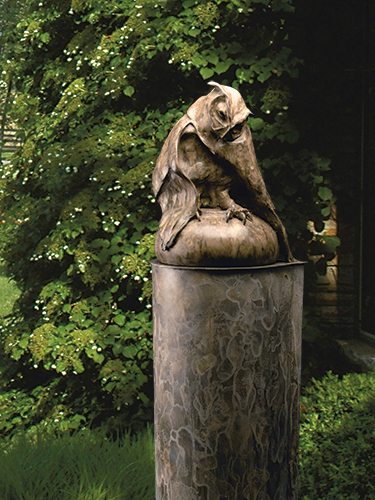 This subject of this month’s post is The Owl Foundation in Ontario, Canada. I will donate a portion of the sale of “Mezza Luna” or other sculpture of mine to either The Owl Foundation of any non-profit charity you choose. “The Owl Foundation is a registered Canadian charitable organization focused on helping wild Canadian owls that are injured or orphaned. The Foundation operates an owl rehabilitation centre located in the Niagara Peninsula, Ontario, Canada. We help owls that are injured, diseased or starving, to get back to a condition where they can survive on their own and can be released. Some owls with permanent disabilities that are otherwise healthy are kept and used as foster parents, raising orphaned owl chicks in natural-type enclosures. Once old enough, these young birds learn to hunt live prey while still in captivity. The young owls are released when they are able to survive on their own. Where suitable pairs can be formed among the owls with permanent disabilities, the birds are given the opportunity and conditions to breed and raise their own young, which are later released. We provide spacious outdoor enclosures for the owls, permitting flight over a distance and providing a variety of perches and degrees of cover. We receive many injured and orphaned owls each year. Injuries are most often the result of being hit by vehicles and occur predominently when owls are hunting near roads. Volunteer drivers transport owls to the Foundation and our staff work closely with a number of veterinarians to provide treatment to owls in distress. We have experience with all Canadian owl species. Many of these are represented among the permanent residents, including migratory species and those that breed in the far north. When owls of northern species are released, they are shipped by air to volunteers in suitable northern locations for release. All other species are released within a reasonable distance of where they were recovered. The Owl Foundation employs 4 people, but also relies on volunteer effort in many ways. Most of the Foundation’s funding comes from individuals, with some from corporations and granting foundations. Together we can make a difference. I will donate to this or any of your charites with the purchase of any of my artwork. “While trekking through the primeval landscape of Soysambu it is hard to ignore the rhythms of its past….and concerns for the future. Thousands of years ago, this area was rent by violent volcanic activity. Huge volcanoes to the south sent massive lava flows towards the lake which, in those times, was much higher than today. Around the western shore, molten lava burst through the earth’s crust creating a jumble of black lava ridges and plateaus interspersed with hidden glades and hollows. Near the lake itself, these are filled with 10 foot high bamboo grass but further inland, they contain beautiful yellow acacias and rich green warburgia trees. In the shallow water on this side of the lake are a number of low, rugged, lava-rock islands. Here is one of the few nesting sites in Africa of the Great White Pelican. The islands are packed sometimes with shoulder-to-shoulder nesting birds or at others, a tightly packed host of dark colored fledglings. Elmenteita does not have an adequate food supply for all these huge birds so they fly the 10 miles westwards to Lake Nakuru to fish and bring the catch back in their large beak-pouches to their young. The sky is therefore often filled with great flocks of pelicans circling in formation, seeking the thermals to lift them over the ridge to Nakuru. Distant ancestors occupied this area made evident by nearby archeological sites Kariandusi, Hyrax Hill and Gambles Cave. The Maasai passed through on their nomadic journeys, many battles took place in the area and the first European Explorers recorded the wildlife and peoples of this area in their journals as they made their historic treks across Africa. It was wild. The history of Soysambu spanning the last century is inseparable from the name Delamere: today’s successful farming methods were originally pioneered by the first Delamere to settle in Kenya, the third Baron: born Hugh Cholmondeley. An important character in Kenya’s past, Lord Delamere dedicated his foresight and British fortune to develop Kenya’s farm potential into one of the most efficient and prosperous in Africa. A great adventurer, Delamere arrived in Kenya on foot after a 1000 mile walk from Somalia – and fell for the country. He returned to settle permanently in 1903 with his first wife Lady Florence, daughter of the Earl of Enniskillin and their son Thomas, who was born in 1900. Their initial home was at Njoro, but in 1906- after suffering heavy losses of livestock and money – they moved much of the livestock to recently acquired land at Soysambu.Soysambu means “the place of striated rock” in Maasai. Sambu is also the Maasai name for a cattle colour. The ranch was thus named because it seldom saw rain and cattle died by the hundreds in the frequent droughts. Delamere continued to sink vast sums of money into crop ventures at Njoro and livestock experiments at Soysambu, while also forging friendly relations with local Maasai and thus acquiring valuable knowledge and insights. Known to friends as “D”, Delamere was a controversial voice in settler politics, and reputedly an entertaining guest at parties. His bronze statue, once on the formerly named Delamere Avenue in Nairobi, is now on back on Soysambu beside the Delamere home where it looks pensively across the lake to the hill known as Delamere’s nose or The Sleeping Warrior.Gwladys, former wife of Sir Charles Markham, first arrived in Kenya in 1928 to become the second wife to the third Baron Delamere. Thirty years younger than him she looked after him until his death in 1931. She later became Nairobi’s first lady Mayor and was highly respected for her work during the war.Thomas, fourth Baron Delamere, was married first to Phyllis Montague Douglas Scott, with whom he had two daughters and a son, and then to Mary Cunningham-Reid (sister of Edwina Mountbatten), before he married the colourful Diana in 1955: he was her fourth husband! The fourth Baron died in 1979, while Diana continued to live on Soysambu, pursuing her passion for horse-racing in Nairobi, and deep sea fishing in Kilifi – until she died in 1987. She is buried near Naivasha’s Crater Lake –between two of her husbands and two of Kenya’s former great landowners: Gilbert Colville and the fourth Baron Delamere. The other members of the Delamere family are buried on Soysambu in a peaceful Acacia glade, frequented by wild creatures.Soysambu remains a working cattle ranch with some of the best Boran cattle in Kenya. The fifth Baron, today’s Lord Delamere, still lives on Soysambu. The financial challenges of continuing Soysambu as only a cattle ranch are insurmountable with the pressures on the wildlife in this area due to the escalation in human population and decimation of natural habitat surrounding the area. Soysambu which plays a major role in the Elmenteita-Nakuru Eco System is being transformed into a Conservancy to be protected for future generations and to preserve a wildlife corridor from Nakuru to Naivasha. Tourism and enterprise programs are being developed to provide reinvestment in Communities and Conservation. Massive funding will be needed to help in these efforts along with anti-poaching security, research facilities and wildlife management. There are many serious challenges facing the survival of Soysambu. Soysambu Conservancy works to sustain wildlife species, indigenous livestock and habitat; supports local conservation initiatives; facilitates neighboring development and educates the community in the value of flora and fauna in order to preserve the Rift Valley Ecosystem for future generations. Ann van Dyk represents what I found so often in Africa where the political environment is difficult at best. It is what I call the power of one: how one person can affect an outcome in the environmental world. I created this cheetah, Lise, while we were working with Africat in Namibia. 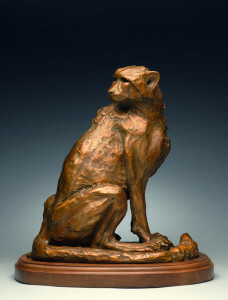 A portion of the sales of this sculpture will go to helping the Ann van Dyk Cheetah Centre. What is also a common thread is that by working to protect the cheetah, other species also came into focus: the cape vulture and the African wild (painted) dog. The following is taken from an article written in March, 2010, in the Christian Science Monitor titled “The Big Cats’ Best Friend”. 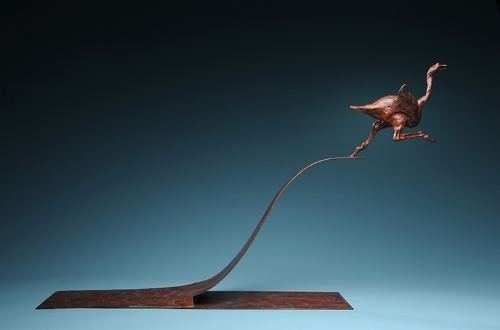 There are cat people, and then there is Ann van Dyk. Living on her family’s farm north of Pretoria, she bought two cheetah cubs from a local farmer – much as any farm girl might take in a stray dog or cat – only to have them confiscated because they were an endangered species. Chastened but unbowed, she and her brother would eventually offer 99 acres of their family’s farmland to the National Zoological Gardens of South Africa in Pretoria, which had a cheetah breeding program but needed rural land in order to expand it. So in 1971, the De Wildt Cheetah and Wildlife Centre (recently renamed the Ann van Dyk Cheetah Centre) was born. Its goal: breeding cheetahs and educating native farmers about their value. “I think the fact that cheetahs are an endangered species, and nobody was doing anything about it, that was the reason I started this center,” says Ms. Van Dyk, now in her 70s but still very much like the idealistic girl who started the center. Ann van Dyk with one of her cats. Today there are perhaps 7,500 cheetahs left in the wild, down from 100,000 around the turn of the 20th century, and some scientists believe that cheetahs could become extinct within the next 15 years. In the past, hunting and farming were the big cats’ main enemies, but now their numbers are so small that scientists worry about the dangers of inbreeding among those who survive. What is needed is land and lots of it – without sufficient land in which to roam, cheetahs go into a kind of neurotic depression and stop breeding. This is where conservationists like Ann van Dyk can make a difference.